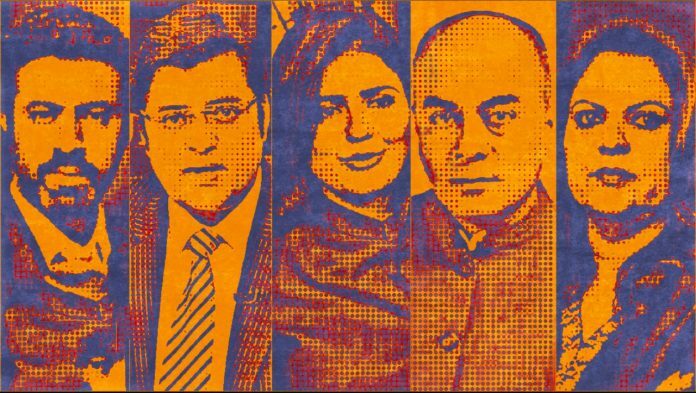 From TimesNow, Republic TV to AajTak, NDTV, we track how India’s top news anchors are reporting on the 2018 assembly election results. Here are the live updates. New Delhi: Welcome to ThePrint’s live blog on the Assembly election results. 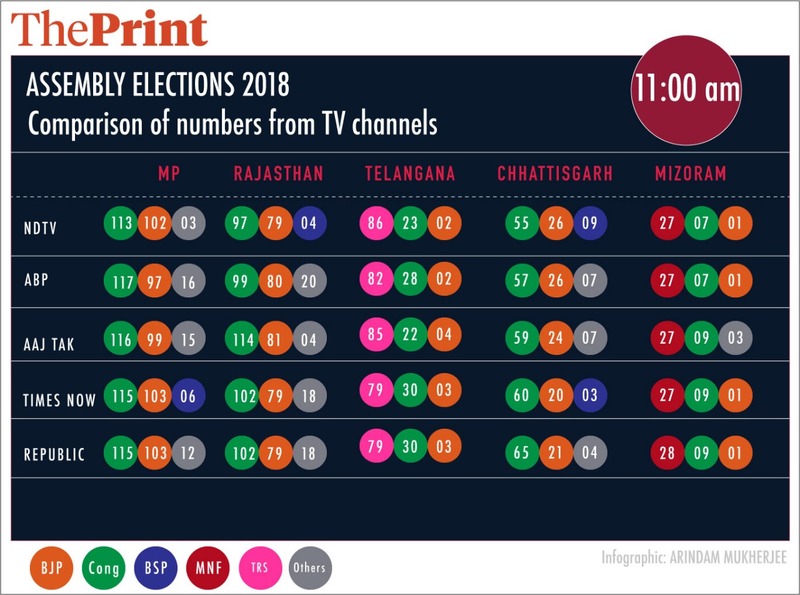 With the Congress set to form governments in Rajasthan and Chhattisgarh, and pulling ahead of the BJP in Madhya Pradesh, and regional parties TRS and MNF heading for big wins in Telangana and Mizoram, we look at how the highs and the lows, the euphoria and the deep dive are manifest through our TV ‘sutradhars’. 08:00pm: And that’s a wrap. 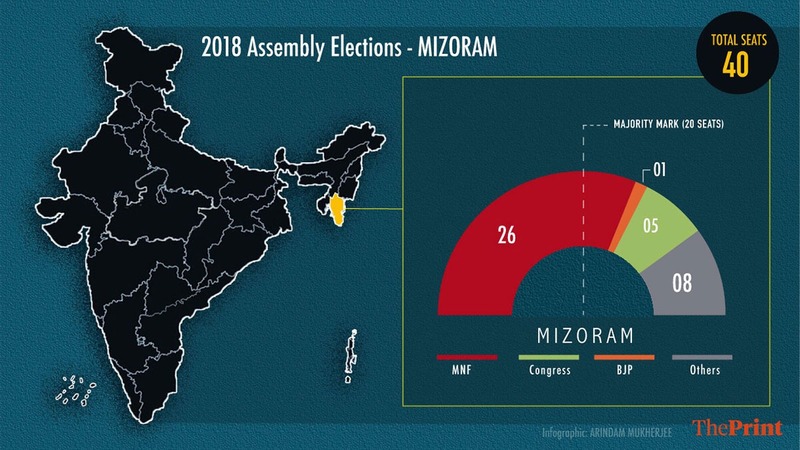 Come back to ThePrint to see what happens in Madhya Pradesh, Chhattisgarh, Rajasthan, Telangana and Mizoram going forward. 06:41pm: Nearly 12 hours since TV news channels have begun their coverage of the 2018 assembly election results, the strain is starting to show on news anchors and panelists. On TimesNow, Rahul Shivshankar referees a verbal fight between his panelists. 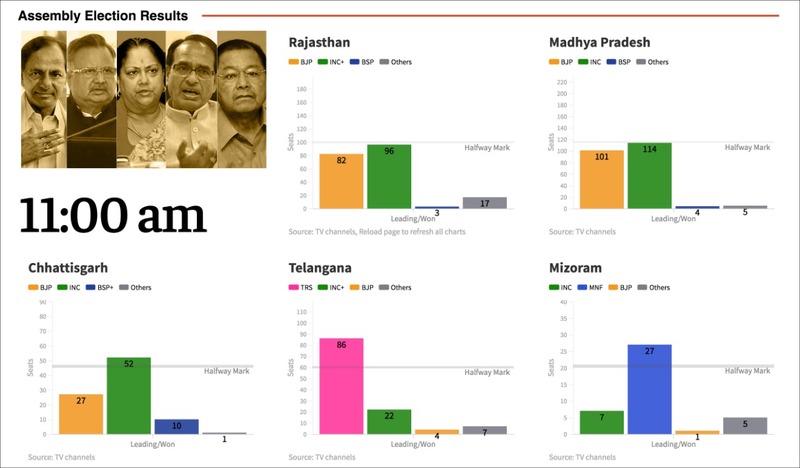 06:25pm: Madhya Pradesh results remain a tight race between Congress and BJP, with the grand old party ahead by just 4 votes. As the wait continues, here’s some Twitter relief. Around every winning politician, is a group of people only shouting "yaaaaaaaaaayyy". Irrespective of what the leader said to the camera. 05:51pm: Raman Singh thanks the people of Chhattisgarh for having allowed him to serve for 15 years. Singh was chief minister for three consecutive terms. 05:46pm: Raman Singh, who was fighting to retain power in Chhattisgarh, says this is a state election result, the 2019 elections we will fight later. The BJP have so far won 18 seats while the Congress has pulled ahead with 64 seats. 05:35pm: Patra says the elections were highly localised. Tehseen Poonawala says the issue of Ram mandir needs to be dropped. 05:31pm: Sambit Patra sparks a war of words on Zee News. The BJP spokesperson says, “If people were angry on agrarian issues, then the result should have been like Chhattisgarh. This is anti-incumbency at the state level, but the neck and neck fight reflects it is not a reflection on central government.” Before he can finish, a loud argument drowns his words. 05:20pm: AIMIM’s Asaduddin Owaisi says his party will definitely stand with chief minister KCR in Telangana. Owaisi goes on to say the country requires a non-Congress, non-BJP leader — a leader like K Chandrashekhar Rao. 05:15pm: It’s an interesting turn of events for Rahul Gandhi as the media, as well as the BJP, considered him something of a joke. 05:10pm: Rahul Srivastava, national affairs editor at NDTV, commends Rahul Gandhi for his leadership — for giving freedom to young leaders like Sachin Pilot, avoiding the temptation of going with BSP, and choosing TDP over TRS in Telengana. India Today’s Kanwal says people have to take him more seriously. In MP his strike rate is not bad: 26 rallies by him, 13 leads so that is 50 per cent conversion rate. 05:03pm: KCR says there is a confusion in the country at the national political level, and assures that his party will play important role going forward. 05:02pm: K. Chandrashekhar Rao, popularly called KCR, addresses media after his party Telangana Rashtra Samithi wins Telangana assembly elections. Says his party will give a new definition to the national politics. 04:59pm: Arnab Goswami gets very upset on Republic TV when pro-BJP analyst Shubhrastha says that sitting Madhya Pradesh CM Shivraj Chouhan was a man of the soil and that the presence of PM Modi made the campaign “national”. I contest that; please prove what you just said, Goswami says. “I just told you that it was Modi which gets the BJP its votes,” he adds. 04:43pm: On India Today, academic Mahesh Rangarajan says that if it becomes a Narendra Modi versus Rahul Gandhi contest, then that is playing into Modi’s hands. If the 2019 elections are fought on issues, then leadership will also enter the picture. Congress has to think about it. 04:39pm: DD News is giving Congress 119 seats in Madhya Pradesh now. 04:35pm: A quick recap — regional channels for Rajasthan and Madhya Pradesh had given Congress larger leads earlier, when the ‘national’ channels were calling both neck to neck. 04:28pm: Telangana Rashtra Samithi, which was described as a ‘car without brakes’ earlier in the day, celebrates its victory with a 90-kg cake, complete with pink frosting. 04:12pm: Caretaker chief minister K. Chandrashekar Rao is set for another term in Telangana with his TRS party crossing the majority mark and leading with 86 seats. 04:05pm: Arnab Goswami says the numbers on Madhya Pradesh’s results has settled a bit. With numbers not expected to fluctuate much more, he says, “Shall we begin the debate? What matters more: 3-0 or BJP saying it was a closer fight?” Political analyst Kanchan Gupta says Congress has emerged victorious in perception, but they should have swept with a three-fourth majority. That makes it a moral victory for BJP. 03:48pm: News India is also showing a clear Congress lead, but you never know. CNN channels have remained faithful with a Congress lead for the last one hour, and even now, it has given Congress 118 and BJP 101 seats. Are we nearing the end? 03:43pm: In the wait for MP’s final results, India TV has a dancing Rahul Gandhi graphic and another of Vasundhara Raje rubbing tears from her eyes. Perhaps out of disbelief that she won so many seats in Rajasthan? 03:35pm: Currently in the Madhya Pradesh see-saw battle, Congress has 115 and BJP 105. The nail-biter has now lasted four hours. At 11:30 am, supporters of Congress leaders Jyotiraditya Scindia and Kamal Nath had got into a competitive bursting of crackers. If they had paid more attention to shelving their own rivalries and egos, the Congress may have had a much smoother ride. 03:28pm: Congress leaders in Rajasthan have also beaten a hasty retreat. The state was ripe for the plucking, what with a hugely arrogant outgoing chief minister Vasundhara Raje as well as the communal polarisation of the state. If only Sachin Pilot and Ashok Gehlot had been able to dissolve their rivalries. 03:22pm: The Congress is now just over the half mark in Rajasthan, leading in 103 seats, while the BJP has fallen to 68 seats, according to NDTV. It will almost certainly form the next state government. But the minor heart-attacks of the last few hours were totally unnecessary. The Congress should have swept the state, like all exit polls had predicted. This is a lesson on how-not-to-fight-an-election-and-take-your-voters-for-granted. 03:18pm: India Today’s Padmaja Joshi tells BJP spokesperson Narendra Taneja that the Congress managed to script a success by learning from the BJP. It’s like they took your notes, and passed the exam, she tells a non-combative Taneja. 03:11pm: Market guru Saurabh Mukherjea, founder of Marcellus Investment Managers, tells CNBC TV18 that the more important event in the last 24 hours for the market is the resignation of the RBI governor and not the assembly elections results. So, he’s not surprised that the stock markets have taken assembly elections results in their stride. 03:05pm: BJP’s Yashodhara Scindia says spoke to her sister Vasundhara Raje who sensed victory as women came out in large numbers. She says her sister was questioning herself on what else could she have done over five years. 02:59pm: A confident Sachin Pilot says the Congress was marching towards victory in Rajasthan, Chhattisgarh and Madhya Pradesh and the trend would continue in the future in the rest of India. 02:50pm: After a commercial break, Times Now had a UFO flying into the frame. Is it an aeroplane? Superman? It’s a drone! Or the graphic of one at least. Waiting for the final results in MP makes channels do extraordinary things to hold onto viewers. 02:44pm: Stock markets recover big time. Sensex up 200 points. Was down 400+ in the morning. So that’s a wild swing of 600 points. Market analyst S.P. Tulsian says on CNBC TV18 that markets seems to be reassured by the fact that it’s much closer in the 3 heartland states and BJP might only lose about 30 of 65 Lok Sabha seats these states contribute. 02:32pm: Cheers and applause from unseen panelists on Times Now as Navika Kumar announces that BJP gets 116 in MP, the half-way number required to win the state. Silence follows soon after as the party returns to 114. 02:23pm: On NDTV 24×7, Vikram Chandra asks Congress leader Renuka Chowdhary about alliances in Rajasthan and MP. The art of politics is converting a possibility into a probability, she replies enigmatically. 02:16pm: Now, Congress submits a complaint to Telangana Chief Electoral Officer Rajat Kumar saying EVMs manipulated in Telangana. The party calls the trends “distorted” and “far away from from ground realities”. 02:10pm: India TV anchor Saurabh Sharma says 44 seats are up for grabs in Madhya Pradesh. BJP is leading in 25, and if that holds true to the end, BJP will win MP. 02:07pm: Aaj Tak analysis of Chhattisgarh voting patterns shows BJP suffering a 51 per cent loss in votes and a gain of 48 per cent for the Congress, hence the clear cut victory for Congress. 02:05pm: Even as we update, TimesNow says its 99 now and Congress ‘teetering’ on the 100 mark in Rajasthan. See? 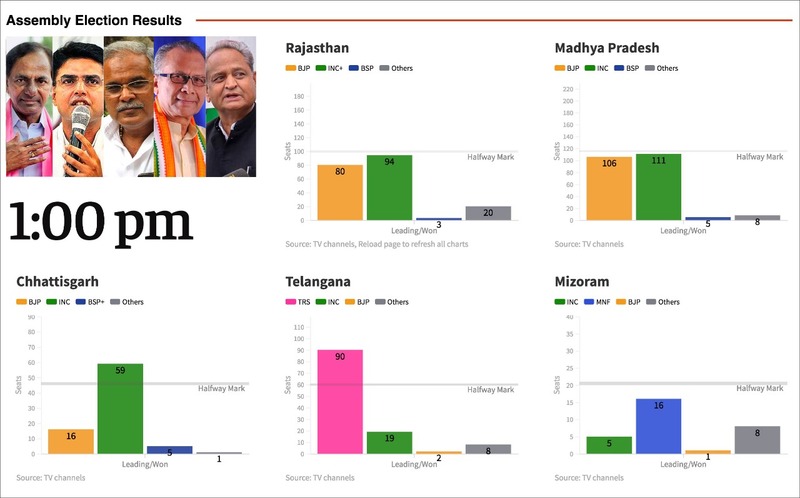 02:03pm: TimesNow and India Today showing that Congress has crossed the 100 mark in Rajasthan. Gosh! If this was cricket, a century remains a century, but here the Congress could see its score fall below the three-number mark. 01:55pm: Twelve rounds of counting are left in Madhya Pradesh, says anchor Rahul Kanwal on India Today, citing the Election Commission. Only 10 rounds have been counted so far. Get ready for a long afternoon’s journey into the results. 01:23pm: ABP news anchor Sumit Awasthi said that BSP supremo Maywati had called all the party’s winning candidates from Rajasthan, Madhya Pradesh and Chhattisgarh to Delhi in order to avoid poaching. Also, she will reportedly not support the BJP to form a government. 01:06pm: Times Now reports Rajasthan is in favour of Congress with 91-84. Will we see a reversal soon as the BJP plays catch up? 12:51pm: Congress leader Sachin Pilot in talks with 8 independents in Rajasthan, reports ANI quoting sources. 12:36pm: DD News reports 99 to 74 in Rajasthan to Congress and 110-109 for BJP in Madhya Pradesh. 12:34pm: Times Now anchor Navika Kumar describes the battle in Rajasthan as being in a state of seesaw. “It’s 95 to 81 in the state just now in favour of Congress,” she says. 12:32pm: On News X, senior journalist Sheela Bhatt says the narrative of the Opposition was that Modi’s government is not democratic enough, is hitting institutions, and bringing in a Hindu Rashtra. Bhatt says that even though they will be very happy with this (result), the beauty of this election is that the BJP also won’t be unhappy with this showing. 12:29pm: Republic declares ‘dead heat in MP’. 108 each, for Congress and BJP. 12:25pm: Anchor Bhupendra Chaubey informs viewers that CNN News 18 has stopped discussing the numbers since they are too volatile, prompting a general discussion on farmers’ distress as the message of 2018. The channel then breaks for commercial. 12:22pm: Mizoram CM Lal Thanhawla loses both his seats, reports NDTV. 12:21pm: BJP leader Shaina NC on ET Now says that MP Congress party manifesto appropriates temple hopping and is interested in handing out freebies. She stresses that the BJP, however, is focused on creating an economically empowered society. 12:18pm: According to official EC data, it is 97-75 for Congress in Rajasthan and 110-108 for BJP in MP. 12:16pm: Gehlot appears to be going off-script. Even unpopular Vasundhara Raje has been able to hold her own With terrible ticket-distribution for the Congress and the support of influential former royals for the BJP playing their part. 12:15pm: Congress leader in Rajasthan Ashok Gehlot says the party is open to people from other parties leaving and joining the Congress, reports NDTV. 12:07pm: Consulting editor at India Today Rajedeep Sardesai says that ticket distribution is the problem in Rajasthan for Congress. “You cannot bowl yourself a googly with Modi and Shah in the mix,” he says. 12:06pm: Aaj Tak reports that the Congress’ lead had suddenly jumped past the majority mark in Madhya Pradesh, with a count of 115 seats. 12:05pm: Union home minister Rajnath Singh says on India Today that the verdict is a reflection on state governments, reminding us that the grand alliance lost badly in Telangana. 12:01pm: Havan and celebrations for Congress workers, but BJP supporters are conspicuously missing from their party headquarters. 11:54am: Congress’ refusal to reach out and ally with BSP in Madhya Pradesh has led to its vote being thinned out in the state. Meanwhile, as many as 28 rebels in Rajasthan meant that Congress ticket-distribution was factionalised between the Sachin Pilot and Ashok Gehlot camps. 11:49am: Assembly poll results may not be a verdict on PM Narendra Modi’s popularity but they certainly bring a clear lesson for the BJP: That it cannot rely solely on the Modi factor to win elections. Read more. 11:47am: CNN News 18 anchor Bhupendra Chaubey says the trend is clear, the story is that BJP is ceding space in rural areas. 11:45am: Full faction-infighting in the Madhya Pradesh Congress is playing out between supporters of Kamal Nath and Jyotiraditya Scindia, clearly encouraged by the two respective leaders. Seems each of them wants to pre-empt a decision by the Congress high command in the other’s favour. 11:44am: NDTV reports that the leads are back for the BJP in Madhya Pradesh with 116-105 in the party’s favour. Political analyst Amitabh Dubey (son of Rajiv Gandhi’s close aide Suman Dubey) points out that MP is the stronghold and ‘garh’ (house) of the BJP, even more than Gujarat. 11:43am: NDTV reports dead heat in Madhya Pradesh with 112-108 in favour of BJP. 11:19am: Sachin Pilot is certain Congress will emerge victorious in Rajasthan, despite figures slipping down from initial reports. Now, Congress reportedly has 99 seats while BJP holds 75. Pilot also points out it’s been exactly a year since Rahul Gandhi took over as Congress president. 11:15am: Republic TV shows celebrations at Congress party headquarters in Delhi as MP Congress leader Kamal Nath supporters shout slogans in his favour. Clearly, they want to pre-empt any move by the Congress high command (read Rahul Gandhi and his advisors) to give the state to Jyotiraditya Scindia, a much younger leader and a Kamal Nath antagonist inside Madhya Pradesh. 11:07am: CNBC TV18 anchor Prashant Nair is pleasantly surprised that Nifty is down by only 70 points even though it looks like BJP could lose all three states, and also considering the shock Urjit Patel resignation yesterday. Not a bad outcome, he says. 10:40am: News channel TV9 calls the Telugu Rashtra Samithi a car without brakes. 10:36am: Janta janardhan ka dhyan rak kar ke…I hope MPs will work in the national interest, says Modi. This is probably the first time that the PM has spoken in such a conciliatory manner. 10:31am: Amid the election mayhem, MPs assemble at Parliament for the start of the winter session. Prime Minister Narendra Modi addresses media. 10:27am: This will put Congress in the driving seat for 2019, Bhartia adds. “There’s also danger of BJP resorting to populist measures and what that does to the fisc could be dangerous,” she concludes. 10:25am: Shobhana Bhartia, chairperson of Hindustan Times, makes a rare appearance on CNBC TV18. Says looks like it will be 5-0 against BJP. Things will definitely not be as rosy for BJP going forward. It’s a big jolt for them. This will make Congress a secure partner in the mahagathbandhan. An emboldened Congress will be a stronger fulcrum, she says. 10:24am: Arnab Goswami can’t seem to believe Congress may be taking Rajasthan. “It is remarkable and well done that you got Rajasthan right,” Arnab congratulates the psephologist Pradip Mathur. 10:18am: The cliffhanger in Madhya Pradesh continues. Republic TV reports 104-102 in favour of the Congress. Arnab Goswami says, “I don’t think Madhya Pradesh has gone to the Congress just yet.” He’s beginning to sound forlorn… Hold on! BSP leads, especially in the Chambal region, seem to be converting into BJP leads. 10:07am: The noise level goes up on Times Now as everyone screams. Senior journalist R.Rajgopalan is repeatedly asked by Navika Kumar to ‘calm down’. 10:05am: Telangana chief minister K.Chandrasekhar Rao’s daughter Kavitha says there was “never any doubt” about her father winning, and that N.Chandrababu Naidu was just trying to hide his failures in Andhra Pradesh. Winners take all, of course, which means that KCR’s gamble to call early elections in Telangana has paid off. 09:57am: Anchor Latha Venkatesh asks Mukherjee, “What about the stability factor.” He says look at the evidence. Nifty gave returns of 130% under UPA-1 and 50% in last 4 years under Modi. Shereen Bhan, another anchor, agrees with him. Bhan says Morgan Stanley market strategist Ruchir Sharma told her the same. 09:53am: Market analyst Udayan Mukherjee is offering comforting advice now. There’s not much difference between one party and another. It’s unnees-bees (neck and neck), he says. 09:51am: Times Now anchor Navika Kumar is calling the Mizoram assembly election, says Congress is out. 09:45am: DD News trends for Rajasthan report 89-76 for Congress. This is getting close. 77-67 for Congress in MP. 09:42am: Arnab Goswami on Republic TV says, “Nobody on this channel expected the Congress to do so well in Rajasthan.” Really? What has Goswami been doing these past several weeks, one wonders. So many Ramayana analogies come to mind. Rip Van Winkle, move over. Was this a slip of the tongue on Goswami’s part? 09:35am: Telangana Congress claims 22 lakh votes have been deleted. Are they making excuses for their terrible performance? Should the Congress have allied with Chandrababu Naidu, their former sworn enemy? 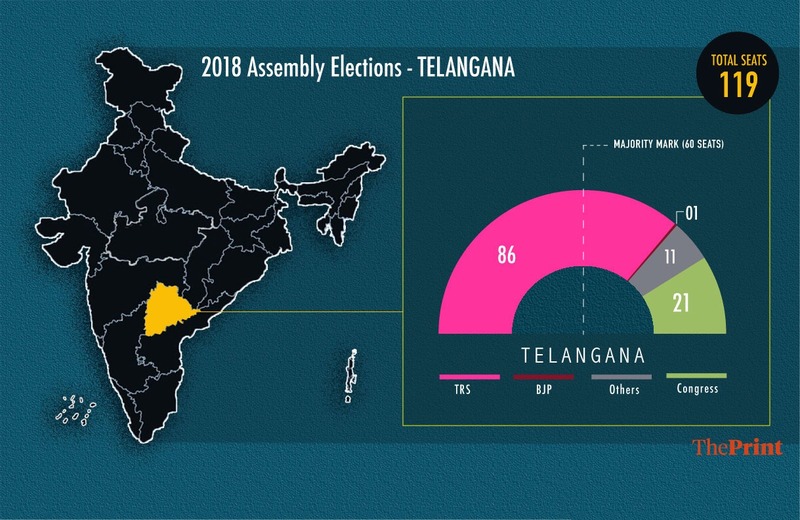 09:22am: India Ahead has called the results in the Telangana assembly election even though seats are yet to be declared. They have just congratulated Kalvakuntla Kavita of the ruling TRS for winning the election. Too soon? 09:20am: India Today shows Rajasthan at 94-65 in favour of the Congress, and the BJP trailing in over 70 per cent of its constituencies. The “swingers” consist of 60 seats, with both parties leading in three each so far. There is a newbie data screen showing 56 new candidates for the BJP, of whom four are leading. 09:16am: Aaj Tak and TimesNow report Chhattisgarh CM Raman Singh is trailing on his seat. 09:09am: Market analyst and former TV anchor Udayan Mukherjee says on CNBC TV18 that 2-1 in favour of BJP in heartland is not comforting as BJP won 62 of 65 Lok Sabha seats in these states in 2014 and that could be affected this time. 09:02am: Not much noise on business channels yet. Talk is mixed between poll results and the latest developments at the RBI. Sensex is down by just 225 points and Nifty 125 points in pre-market opener. 08:55am: Why can’t Arnab Goswami and his political analysts sit down and shout at each other? In Rajasthan, the race is neck and neck. 56-42 for the Congress. In MP, Congress has taken an “interesting lead,” says Goswami. 08:54am: A shouting match is fully underway on Republic TV. “I want a minute,” shouts Arnab Goswami, banging his fist on the table. Hold your horses Arnab, says one guest, who stands up so he can make himself heard. Calm down, says Arnab. “We are seeing a monstrously interesting performance,” he adds. Not clear which state he’s referring to. Meanwhile, can someone give him a dictionary please? 08:42am: ABP has an ‘Akashvaani’. A male voice pretending to be God, or so we think, announces the latest trends. “Chhattisgarh main Congress aage!” At the moment, 20-18 are in favour of the Congress. 08:41am: News 9 reports that Congress has shifted its candidates to a resort for fear of poaching in Telangana. This is what we call ‘resorting to politics’! 08:33am: On ABP News, the trend stands thus — Congress surging ahead in Rajasthan, leading in 21 seats already within half an hour of the polls opening. Remember that in 2013, the Congress won only 21 seats, while BJP won 163 seats. 08:25am: India Today says 7-5 leads are in favour of Congress in Rajasthan. 08:18am: CNN-News 18 executive editor Bhupendra Chaubey asks: “Is history about to be defined?” Senior journalist Swapan Dasgupta demurs: “The BJP did mount a spirited last stand in Rajasthan and fell away somewhat in Chhattisgarh and Madhya Pradesh.” Political commentator Sanjaya Baru says that if the BJP wins Rajasthan, it will be because of Modi. 08:17am: Guess what… Congress supporters have organised a ‘havan’ outside Rahul Gandhi’s home… clearly, unlike Shivraj Chouhan in Madhya Pradesh, they probably couldn’t get in. 08:14am: On NDTV, the first trends are trickling in. In Rajasthan, Congress leads 5 out of 8 seats. Is this a trend? Be warned, says Prannoy Roy, these are postal ballots, but Shekhar Gupta, editor-in-chief of ThePrint, points out that BJP does better on postal ballots because people in the armed forces, etc, are voting. 08:12am: Ticker tape on News9 says the Telangana Rashtra Samithi has a lead, though no results have been declared yet. 08:10am: On TimesNow, Congress leader Jyotiraditya Scindia says: “It will not just be a Congress government (in Madhya Pradesh), but the people’s government.” When the reporter asks him who will be the Congress chief minister, he says “let the results come in”. 08:07am: Republic TV founder-editor Arnab Goswami says, “I want to look at this from a national perspective. National perspective. National perspective.” We got it, yes. 08:00am: Election Commission begins counting of votes. And the real action begins. 07:55am: On NDTV, the ticker-tape asks if Ajit Jogi, who broke away from the Congress in Chhattisgarh, will be the king-maker or will outgoing BJP chief minister Raman Singh be able to hold his own and win a record fourth term. 07:52am: On India Ahead, BJP spokesperson Raman Malik says that people sent him videos of them pushing their fingers towards the lotus on the EVM machine. 07:48am: On NDTV, channel founder-editor Prannoy Roy warns viewers that counting in Madhya Pradesh could be slow as the Congress could contest results and the Election Commission has to sign off after every round of counting. And yes, MP with 230 seats is very significant for the Hindi heartland going forward into the 2019 election. 07:45am: On Zee News, the discussion has settled on Hinduism. Maybe they need to visit a temple? Now we are being shown visuals of cows, not sure why. 07:37am: NDTV’s Prannoy Roy does what he does best – that is, looking at the swing factor. The psephologist says that the Congress needs a 5 per cent swing to win Madhya Pradesh. 07:33am: Counting is yet to begin but on TimesNow all hell has already broken loose with too many people talking at the same time and BJP spokesperson Dr Sambit Patra, to whom the question was addressed by Navika Kumar, is listening in stony silence. 07:29am: CPM spokesperson G.N. Nagaraj on News9 says in Telangana, the ruling TRS party is also a party of opportunism. They wanted to have an alliance with AIMIM for assembly elections, and with BJP for parliamentary elections. 07:15am: NDTV founder-editor Prannoy Roy notes that the women turnout was much higher in Rajasthan, Telangana and Mizoram. The new female voter is aggressive and not afraid to come out, but Roy says it’s sad to still see such few women candidates for it doesn’t reflect the reality on the ground. 07:11am: On NDTV, Prannoy Roy reminisces about freedom of speech and democracy, how India fought the Emergency, adds, ‘let democracy win’. 07:09am: Rahul Shiv Shankar on Times Now wonders if opportunism is going to be the game today. “The reason I am expressing some doubt (is) because this ‘opportunism’ (is) going to influence 2019,” he says. 07:06am: On India Today, author and former director of the Nehru Memorial Museum Mahesh Rangarajan says Madhya Pradesh is known to give a clear decision. 07:05am: TimesNow managing editor Navika Kumar counsels viewers to ‘keep faith with’ a channel that is ‘unbiased’ and not concerned with ‘speed’. 07:02am: On TimesNow, editor-in-chief Rahul Shiv Shankar says it’s a “make or break moment for Rahul Gandhi”. 07:00am: On the eve of counting, Aaj Tak in Hindi led with stories anticipating the poll results though many of the other channels were taken up with either the UK agreement to extradite absconding businessman Vijay Mallya or the abrupt resignation of RBI governor Urjit Patel. 07:00am: Welcome to ThePrint’s Live Blog on the 2018 assembly elections results.